The Clock caused me a lot of anxiety throughout the month. On the plus side, all of the stress of Level 3 was pretty much restricted to class time. There was a lot less outside work to be done in terms of studying, so at least I wasn’t tearing my hair out at home. (You might have noticed that I’ve had more time by the increased number of postings per week.) Still there were a few days in class that really had me scrambling. Somewhere around week three I hit a little morale funk. I found myself wishing, yet again, that I were faster so that I wouldn’t be rushing at the end as often. The days I had a second to step back and think about things to make sure everything is being prepared and plated correctly were so much nicer. On the 3 or 4 days where the clock really had it out to get me, I tended to be of the opinion that if I wasn’t freaking out to the point that my hands were shaking as I tried to plate to my food, I really wasn’t doing enough. I also have the gift of being able to turn the area around me into a direct illustration of my mental state. The more flustered I’d get, the more my station would turn into a disaster zone. That way, you know I care. 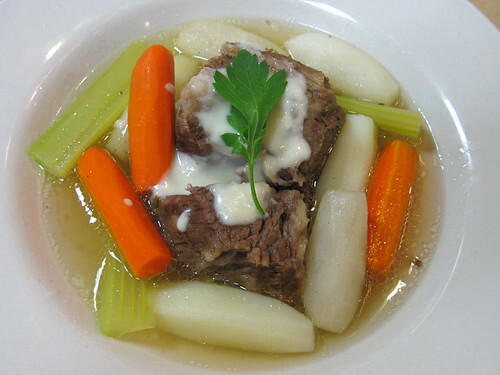 The low point was the day I had to make Pot au Feu. Now, this is actually a very delicious dish, the only problem was that we were supposed to make cocottes from a variety of vegetables for the garnish -- 32 cocottes total. I got my first dish out on time -- Potage Cultivateur, a vegetable soup that also requires a lot of taillage (vegetable shaping.) It was ok, not great, but at least I'd gotten that one in. 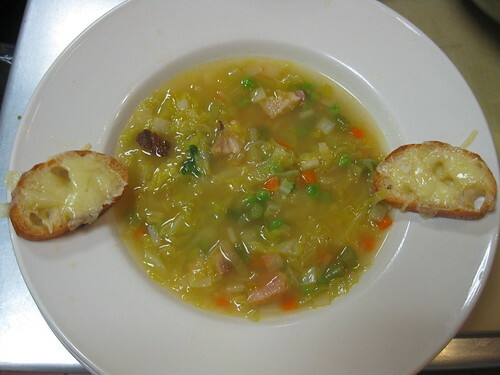 Potage Cultivateur - aka, Farmer-Style Vegetable Soup. This picture was taken when we made it in level one, on Soup Day. It was pretty much all done; I was just missing the damned cocottes. The broth, meat, and sauce for the Pot au Feu were all prepped, but as the minutes whizzed by and my hands moved through carving the little vegetable bullets way too slowly, I started to get flustered. Having to switch between the cocottes and other tasks didn’t help either, and I just couldn’t find a rhythm. The ones I was making started to look crappier and crappier, but more importantly, there just weren’t enough. Pot au Feu day was definitely my low point. I clearly had to change something. The Chefs called me out on my lack of organization during the "Taillage Nightmare," as some of us started calling the Pot au Feu/Potage Cultivateur combination. So, for the last few days of the level I really tried to focus on improving that part of things. Even when I was starting to get harried, I would still try to stop and clean up. Maybe if the state of my brain has an effect on my surroundings, then perhaps the principle could also work in reverse, and the state of my area could have an effect on the state on my brain. I have to admit, it helped A LOT. Nonetheless, I still had a lot of anxiety about the upcoming midterm.